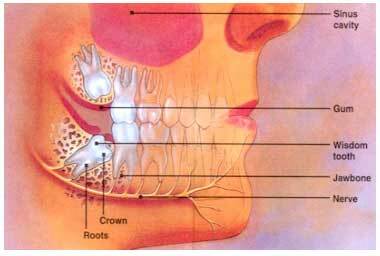 Wisdom teeth are the very back teeth on either side of the upper and lower jaws, and are more correctly described as the third molar teeth. They are the last teeth to erupt into the gum-line, usually between the ages of 17 and 21. It is quite common for there to be insufficient space in the jaws to allow wisdom teeth to take their correct position, and consequently they remain partly or completely below the surface of the gum. Sometimes they may be deeply buried inside the jawbone. Wisdom teeth, which have failed to develop into a normal position, are commonly referred to as being “Impacted”. Due to the complexity of the procedure, extractions of ‘impacted’ wisdom teeth are generally carried out by a specialist Oral Surgeon, often under general anaesthetic. Your dentist will arrange the appropriate referral and OPG (full mouth) X-ray for you. General wisdom teeth extractions can be carried out in our surgery. Surgery to remove the impacted wisdom tooth typically involves a minor incision to uncover the tooth’s crown, then removing the tooth in sections. If any bone was needed to be removed, new bone will regenerate over a six to eight week period. Stitches are placed at the time of surgery and will dissolve after about five days. There are two common after-effects when wisdom teeth are removed; pain and swelling. It is usual for some pain to be present for the first two days, and strong painkillers are provided to enable comfort over this time. There will be some noticeable swelling or puffiness of the cheeks that will normally subside within five days. Occasionally a little bruising, with skin discoloration, may be present below the jaw. Because the jaw muscles become tight following surgery, it may be a week or more before your mouth can be opened widely with comfort. It is common practice nowadays to administer anti-inflammatory medication at the time of the wisdom tooth surgery. However, it is sensible to allow a minimum of four days off work following surgery, and it is advisable to rest quietly at home during this time. A soft diet is also advised. Although wisdom tooth surgery is not something people look forward to, modern surgical and anaesthetic techniques have now combined to make such surgery a far more acceptable experience than in the past.